Beekeeper is a digital workplace app where operational systems and communication channels live within one secure, intuitive platform. Beekeeper connects desk and non-desk employees across locations and departments in real time via mobile or desktop, and includes an intelligent dashboard to help companies improve internal communication and streamline business processes. "Beekeeper is thrilled to be named the HTNG 2018 TechOvation Award Winner," said Corey McCarthy, Beekeeper VP of Global Marketing who accepted the award. "Our digital workplace platform reaches every single employee with relevant messaging. This is critical to the 1.9 million front- and back-of-house hotel employees who don't sit at a desk or have a company email address. When you create a great employee experience, it translates to a great guest experience. Winning the 2018 TechOvation Award signifies that hoteliers see a dire need for digital transformation in workplace communications. Beekeeper not only empowers staff, but our open API supports integration with existing operational systems. That means hotels can use Beekeeper for payroll, scheduling, file sharing, task management, and other systems." "The Beekeeper app uses both factors of convenience and mobility that we see rapidly growing in the hospitality industry," said Michael Blake, CEO of HTNG. "We recognize Beekeeper for their innovation and are very happy to announce them as HTNG's 2018 TechOvation Award Winner!" The HT-NEXT Awards Program was sponsored by Datatrend Technologies. Rob Graves, Vice President of Datatrend Technologies said, "Technology innovation in the hospitality industry is crucial to growth and continued success. 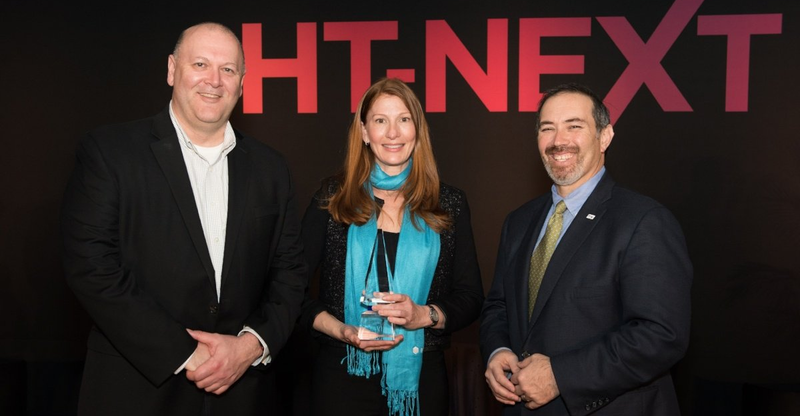 We are so proud of the winners of the HT-NEXT Innovation Awards and we applaud their creative solutions! I've said it before, as a road warrior myself, it's a great time to be a traveler with so many improvements to the guest experience. Sponsoring this program means a lot to Datatrend. Our mission is to help organizations continually modernize their technology to not only better their uses' experiences, but to enhance business outcomes. This program is a perfect complement to Datatrend's role in hospitality technology innovation. Congratulations to all winners and participants; this is a huge accomplishment!" The premier technology solutions association in the hospitality industry, HTNG is a self-funded, nonprofit organization with members from hospitality companies, technology vendors to hospitality, consultants, media and academic experts. Currently more than 400 corporate and individual members from across this spectrum, including world leading hospitality companies and technology vendors, are active HTNG participants. HTNG's Board of Governors, consisting of 21 top IT leaders from hospitality companies around the world, itself has technology responsibility for over 2.5 million guest rooms and world-leading venues.